Elizabeth was a Hungarian princess married at the age of thirteen. She spun wool and baked bread for the poor every day. She had a hospital built at the foot of the castle and went there every day to care for the sick herself. Though she was only 24 when she died, she lived a very full life. She was happily married, had four children, fulfilled her duties at court, lost her husband in the Crusades, fought the politics of the day in his absence and still had time to help the poor and sick with her own hands. The famous legend goes that some thought she was squandering the castle’s treasures on the poor (she was known to give away royal garments and ornaments at times). One day on her way out with bread in her cloak for the poor, she was stopped and asked to reveal her load. When she opened her cloak, not bread but roses spilled out, getting her off the hook. Her astounding mercy and kindness is still world famous 800 years later and she did it all in 24 years. Her feast day is November 17. In her short life, Elizabeth manifested such great love for the poor and suffering that she has become the patroness of Catholic charities and of the Secular Franciscan Order. 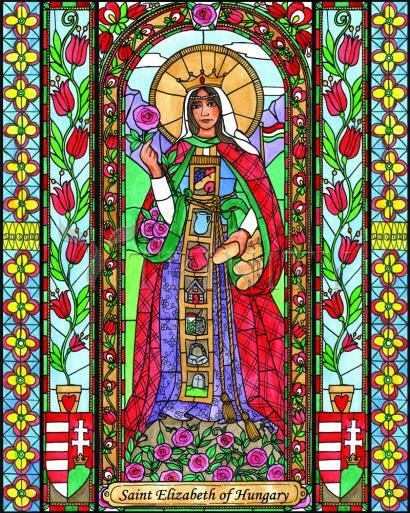 The daughter of the King of Hungary, Elizabeth chose a life of penance and asceticism when a life of leisure and luxury could easily have been hers. This choice endeared her in the hearts of the common people throughout Europe. At the age of 14, Elizabeth was married to Louis of Thuringia, whom she deeply loved. She bore three children. Under the spiritual direction of a Franciscan friar, she led a life of prayer, sacrifice, and service to the poor and sick. Seeking to become one with the poor, she wore simple clothing. Daily she would take bread to hundreds of the poorest in the land who came to her gate. After six years of marriage, her husband died in the Crusades, and Elizabeth was grief-stricken. Her husband’s family looked upon her as squandering the royal purse, and mistreated her, finally throwing her out of the palace. The return of her husband’s allies from the Crusades resulted in her being reinstated, since her son was legal heir to the throne. In 1228, Elizabeth joined the Secular Franciscan Order, spending the remaining few years of her life caring for the poor in a hospital which she founded in honor of Saint Francis. Elizabeth’s health declined, and she died before her 24th birthday in 1231. Her great popularity resulted in her canonization four years later. Elizabeth understood well the lesson Jesus taught when he washed his disciples’ feet at the Last Supper: The Christian must be one who serves the humblest needs of others, even if one serves from an exalted position. Of royal blood, Elizabeth could have lorded it over her subjects. Yet she served them with such a loving heart that her brief life won for her a special place in the hearts of many. Elizabeth is also an example to us in her following the guidance of a spiritual director. Growth in the spiritual life is a difficult process. We can play games very easily if we don’t have someone to challenge us.